As you can see, some of this makes a lot of sense. People in California need to know how to spell “desert” because that’s what the state will be in a few years, people in Washington need to look up information on “pneumonia” when they catch it during all of those rainy days, and people in Florida don’t know how to spell “tomorrow” because all they care about is living in the moment. 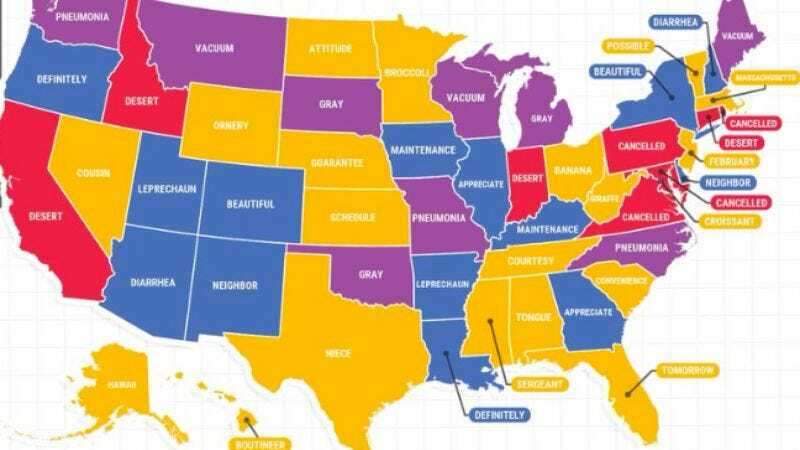 But why is it so important that people in Texas learn how to spell “niece” or that people in Nevada know how to spell “cousin”? And do the people in Wisconsin, Maine, and Montana have a bunch of garbage on their floors that needs to be cleaned up? Then you have Illinois and Georgia, where nobody knows how to spell “appreciate” and is most likely very rude because of it. We’re not even going to wonder what’s going on in Arizona and New Hampshire, but it must be very gross.